Bhuta Kola or spirit worship is an ancient ritual form of worship prevalent among the Tulu-speaking community in Udupi, Dakshina Kannada districts in Karnataka state and Kasaragod taluk in Kerala state alternatively known as Tulu Nadu. 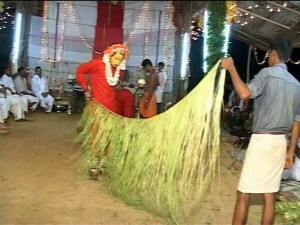 It has close a resemblance to theyyam, a ritual form of worship common among Malayali of North Malabar. 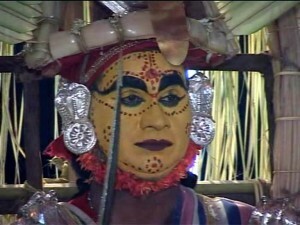 The coastal Karnataka is known for two art forms, namely bhuta kola, a highly stylized version of the ritual dance of the spirit impersonator and a fine tradition of yakṣagāna, creating a world of divine and supernatural beings with all the paraphernalia of costume, make-up, music, dance and dialogue. The coastal districts of Karnataka, Udupi and Dakshina Kannada, collectively known as Tulu Nadu have always been unique from the rest of Karnataka. Rituals like Bhuta Kola, Nagaradhane (snake worship) have given it an identity, distinct from other parts of Karnataka. Among the religious beliefs of South India, spirit worship appears to be one of the most ancient ones. This complex system of rituals and beliefs can be traced back to the tribal era. The music and narratives, dances and dialogues, trances and oracles reflects the socio-economic orders, thought patterns, artistic achievements and socio-cultural values enshrined in the rustic societies of different regions. The origin of Bhuta Kola is difficult to trace. It can be considered as a complex mixture of beliefs, rituals, literature, music and theatrical elements. European colonialists have wrongly described Bhuta Kola as “devil worship” because it is a spiritual belief of indigenous non-Christians. The term “devil” has negative connotation and is a reflection of religious bigotry, and as such should not be applied to Bhuta Kola. In essence, the spirits or the bhutas worshipped are considered to be the guardians of the villages, blessing and protecting the villagers and their livestock. Many of these spirits are said to be attendants of Lord Shiva or ganas. 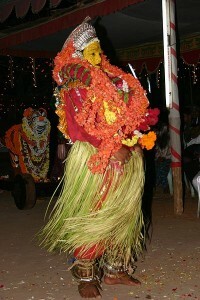 Important aspects of Bhuta Kola are possession, trance and the dialogue of the possessed impersonator with the devotees. The Bhuta impersonator behaves like an incarnation of a concerned spirit, listening, solving problems, warning, comforting the devotees. He acts as a healer and solves the legal and judicial problems of the village. The people of Tulu Nadu follow a tradition of dual worship that includes worshipping the puranic Gods as well as the local spirits. The puranic Gods are worshipped in temple under the leadership of Brahmin priests and the devotees are mere spectators receiving offerings and as such cannot be approached directly. On the other hand, the spirits are the localized and personalized deities who share a more intimate relationship with the devotees. The spirits have fixed spheres of influence and are generally associated with a family or village or region and the devotees offer them periodic oblation. In turn, the spirits protect the villagers and their livestock from danger and warn them as and when necessary. 1) The spirits of totemic origin: Annappa Panjurli (boar), Mula mysondaya(buffalo), Pili Chamundi (tiger). According to the beliefs, Bhutas are believed to be residing in special places called Sthana. Kola is the unique form of worshipping the Bhuta. The night long ceremonies begins in a well decorated arena or pandal that gives the appearance of a ritualistic stage with the image of the deity and other objects of worship well arranged on one side and the disciplined devotees on the other side. The musicians, accompanied with drums and wind instruments are seated on another side are ready to provide beats of varying tempo for different stages in the processions. The pandal is well decorated with various figures made from palm leaf, mango leaf and areca flower. The person who invokes the bhuta or the spirit dresses up in a colourful costumes, complete with a sword, bells and other such accessories. He is slowly prepared for self-hypnotism and for imposing the spirit on him. He is ceremoniously given oil for a ritual bath to make his body physically purified and mentally calm. Pastes from plant extract are used as a makeup for the impersonator. Different colors are used to symbolically display the characteristic features of the spirit. His wife, sister or mother sings the ballad or paddanas which narrate the birth of that spirit, its descent into the land, heroic deeds, its travels and sphere of influence etc. He now assumes the role of the spirit himself and starts calling the authorities to inquire the reason for his invocation. He addresses everyone according to his rank. The organizers propitiate the spirit and beg protection, prosperity, good crop and wealth for the entire community. If pleased, the spirit through the oracle conveys the pleasure and promises protection and prosperity. If the spirit is not satisfied, then he prescribes certain punitive rituals for acts of insult or impurity to the holy place or certain acts of commissions and omissions on part of the devotees. While settling the quarrels or disputes the impersonator assumes the role of a tribunal and conducts himself in a dignified manner as upholder of truth and righteousness. The decision of the impersonator is final without provision for appeal. Guliga also known as KULIYAN in Kasaragod and Kannur districts of North kerala is considered as Shani Deva’s Son (Child of the planet Saturn). According to Vedic Astrology of kerala origin, Ganitha Jyothisha Shasthram consider Guliga as a shadow planet. The placement of Guliga in a Natal Chart in a specific Rashi can give bad effects to the perticular Rashi in question. Guliga Parihara karma, like Sarpa dosha parihara karma is also very important ritual. There is a famous guliga pratishta at Vishnu Murthy Temple at Kakkunje, which is 5 kilometers away from UDUPI Srikrishna Temple. 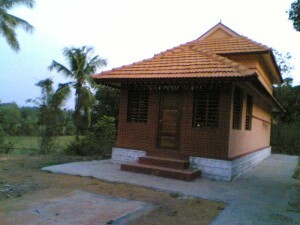 The presence of guliga (Guliga Saanidhya) at this temple was found by famous astrologer and planetary cause investigator Chithrabhanu K Poduval of Payyanur, Kerala. There are dozens of words in Tulu which are used in the context of Bhuta Kola . The most usual are bhuta pattundu (the spirit caught) and maytu battundu (came into the body). Several verbs describe the physical appearance of the possessed (e.g. kumbarunu= shaking) and the internal experience (e.g. ersuntu = rising) are also used. In a ceremonial context, possession of the spirit is more usually referred to as darsana or appearance/revelation. The spirit in question may be one of a number of different categories: bhuta, daiva, kule, preta, sirikulu, cikku, and others. They include spirits of cultural heroes, animal spirits, ghosts, and anthropomorphic divinities of various sorts. Many spirits and categories of spirits have only vague identities, but the character of some is elaborately described in long oral narratives or paād-danāas which describe their birth, “adventures”, and death. Many other spirits are incorporated into these cults under specific conditions. The affliction caused by a spirit is usually described as upadra, or trouble. This term may be applied to certain cases of unwarranted possession, but more frequently used to label violent diseases brought about by spiritual attack on humans, animals or crops. In many of these circumstances there is considerable ambiguity as to whether the spirit is an external agent of affliction or whether his internal presence is the cause of the trouble. Some afflictions are said to be caused by the spirit’s “touch” or “scratch.” E.g. : Pilichandi. Despite the arrival of globalisation and rapid modernization, Bhuta Kola still remains an intimate part of the life of the people in Tulu Nadu. The purists have derided the incorporation of film tunes by musicians during the Kola. The younger generation of Tuluvas, though skeptical about the powers of the spirit, still believe in the rituals. Whether Bhuta Kola will survive the wave of globalisation or whether it will retain its identity or whether it will undergo any transformation is difficult to predict.